Raise or Fold: A Year of Risky Business: "Coach Me, Dude!" The following hand transpired at the Crime Scene Game last night. I had arrived late to the game, after winning my A League tournament. I will admit to being in an expansive mood as a result of having some extra cash to bring to the table. I sat down, bought in for my usual amount (about 66BBs), and promptly lost most of it. REBUY!! I bring another 50 BBs to the table and resolve to play a tighter and more disciplined game. By the time we pick up our story, I am back to break-even. The table is its usual loosey-goosey self, except for two easy-to-spot rocks. I have a goofball on my right who I know will play any two suited, especially if one of them is a broadway card. Most of these people have played with me before and know that I'm generally TAG, with solid value hands, but that I am also capable of firing multiple bullets with air. I rarely, however, show down junk, and my raises are usually respected. If I'm getting called, I need to be wary. I'm on the button at a full table. The action arrives to me with seven limpers already in the pot. Seven (no rocks)! 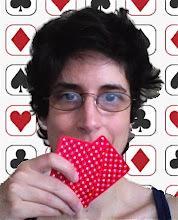 Without looking at my hole cards, I'm already convinced that I'm going to make a big raise and hope either to take the pot right there, or to wind up heads up with decent odds for pretty much any two cards of my own. I peek at KQ suited in spades, and cheerfully pop the bet to 7xBB. I get two callers. One is an okay player in middle position, and immediately I start to consider possible ranges for a limp-call (medium-small pair ~ set-mining, AJ, A10?). I think he thinks I'm on a pure button steal and that he's ahead of my range, which is more or less right. The goofy loose player to my right thinks for a few seconds and then announces: "This is the worst call in the history of America!" The flop comes: 2 2 3 rainbow. The action goes check check to me. I make a half-pot continuation bet, figuring that maybe they'll give me credit for an overpair, but that in any case a) decent player is unlikely to be trapping (not his style, and this flop will have missed his range) and b) loose guy has shown no interest. Decent player folds. The goofster comes back over the top of me for all his chips. I am, of course, done with this hand: check-raise FTW! "Did you really call me with A2?" I ask as I muck. "I told you it was the worst call in the history of the country," he responded, as he flipped over a suited 2 5. On some level, I genuinely admire the audacity of this speculative play. (Alas, they never seem to work for me anywhere near as often as they work for others.) From a tricky, thinking player, it would have given me great pause, and I would have had to use it to significantly modify my understanding of his or her game. Such a player, however, would probably not have check-raised all-in, but rather tried to betsize so as to induce a call. As it is, however, I simply look forward to having this gentleman to my right for many, many games to come. 1) Buy in full. I don't know what a "full" buy in is for your game, but if you have an edge in the game, then buy in for enough to cover everyone, or at least 100bb. 66bb is an awkward stack size and you are giving up EV by playing this way. 2) Raise bigger preflop. Your preflop raise wasn't big enough. There are 7 players already in! In online games, 4bb + 1bb for each limper is a standard raise. For live games, I find that you need to raise even bigger. You want to get the flop heads up AT WORST (best case is taking it down uncontested). 3) Check behind on the flop. You missed. Every PP is either quads, a full house, or an over pair. Will either of them fold 88 here? How about an ace? When you start a hand with an "obvious" steal your cbet isn't going to get the usual respect, so I take the free turn card. If your reads are correct, then you might have the best hand. If there is no action on the turn, then you can bluff the river and maybe make them fold their ace-rags. For the record, though, the title on this post was meant as a tongue-in-cheek remark to Mr. 2-5.